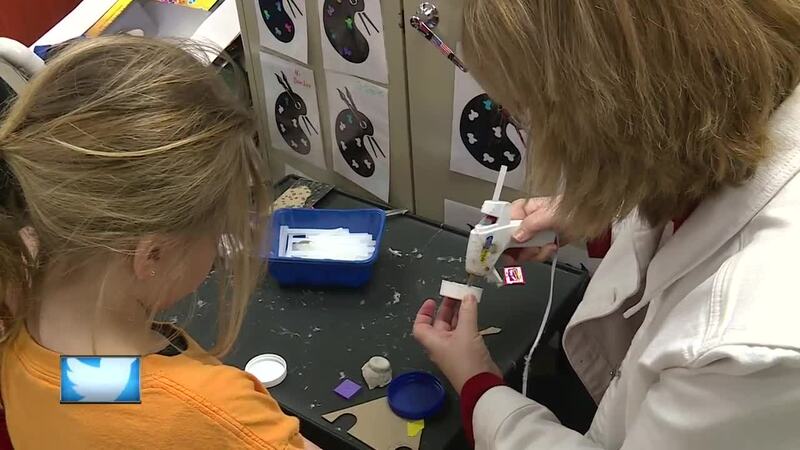 GREEN BAY, Wis. — Students at McAuliffe elementary are using space to create art and learn while having fun, and it's all apart of STEM learning. "I built a flying rover, and it's hanging on the space station," said first grader Cayson Olsen, "they can go on any planet, and it can just look at everything on the planet,"
Olsen said his design is unique, he put tin foil and used cardboard to make his rover, "fly off to Mars!" First grader, Zoey Sundling also said she wants to be a part of something to help astronauts, "a space helmet, space stuff." Librarian Diane Prefonataine said partnering with the Einstein Project, to bring this idea to her students. She said kids are learning through hands on stem focused lessons. "Building, creating problem solving, and critical thinking skills and they think they're just having fun," said Prefontaine. Author Dennis Rockhill, with the Einstein project, said these activities are popular exciting and also ignite creativity, "you get to kind of explore materials, tools, processes, it's just a great way to introduce students to the maker space realm" said Rockhill. Here's a link to the Einstein Project, for more information.